Government bonds across the globe are benefiting from concern about anemic economic growth, the risk of deflation in the U.S., and the Federal Reserve’s decision to reinvest maturing bonds and buy U.S. Treasuries. 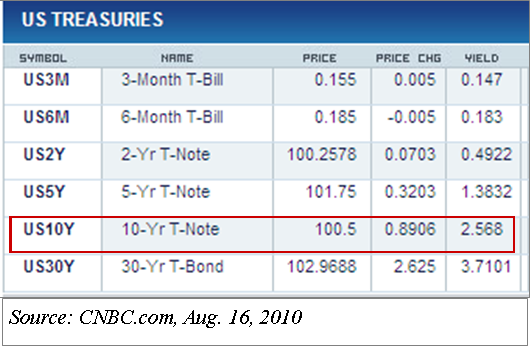 Yields on Japanese, German, U.K. and U.S. government bonds fell to fresh multi-month and, in some cases, all-time lows. Meanwhile, analysts’ advise that “it seems U.S. bonds are still the safest place to hide”, and market herd mentality is making the Hindenburg Omen an ever more self-fulfilling prophecy. With the current terribly low yield (see Treasuries table), it is hard to justify putting one’s hard-earned money into the U.S. Treasury. In fact, forget about the China property bubble over which everyone seems to be losing sleep; the global bond market is truly screaming for an imminent burst. On the other hand, stocks are relatively cheap compared to bonds. 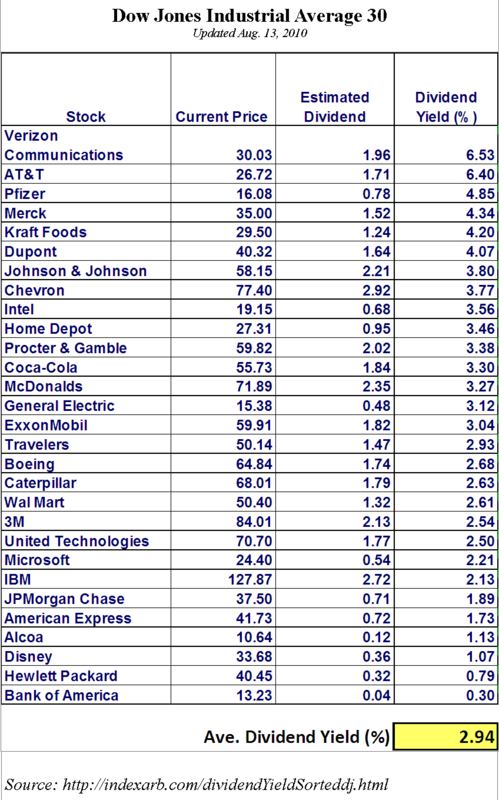 For investors looking for yield and inflation protection, the average 2.94% dividend yield (see Dow table) − plus the potential stock price appreciation − of all 30 Dow Jones Industrial average stocks is looking a lot better than the 2.568% yield on the 10-year Treasury. Equities historically outperform bonds. And the current Dow 30 composition is probably the strongest on record. So, the strategy here is simple − get in on these blue chips when everyone else is still playing musical chairs over at the bond market. Then sit tight, knowing at least a portion of your portfolio will ride the Dow 30’s nice dividend yield, and the price appreciation coming from its solid long-term top-line growth. Source: Dian Chu, Economic Forecasts and Opinions, August 17, 2010.